In our 12th episode of the Oral Torah Series, Yoel and Jeff discuss the Jerusalem and the Babylonian Talmuds. What makes them unique and why? In our 11th episode of the Oral Torah Series, Yoel and Jeff discuss a number of questions that have been piling up during our Oral Torah discussions. We also spend some time discussing the pressures that Yoel, in particular, has been facing concerning our project. We hope that you benefit from this and all of our discussions. In our 10th episode of the Oral Torah Series, Yoel opens up the explanation of what the Talmud is within the practices of Judaism, beginning with ancient perceptions of Judaism in Greek and Roman culture and walking us through the sages and rabbis whose words are recorded there. In this 9th episode of the Oral Torah Series, Yoel explains the Mishna. This is just the first part of the Mishna discussion and has a lot of detail that will need to be carefully listened to in order to understand. What was its purpose and how are we to use it. 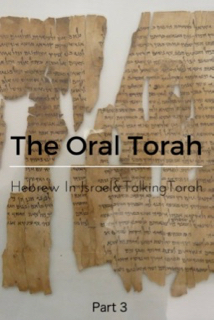 In this 8th episode of the Oral Torah Series, Yoel and Jeff Gilbert’s discussion spends a lot of time on the Ezrah/Nehemia period and the formation of the Halacha that became the fertile ground from which Rabbinic Judaism was formed. In this 7th episode of the Oral Torah Series, Yoel and Jeff Gilbert focus the discussion on the 8th principle of faith as presented by Maimonides and his position on the voracity of the Torah of God given through Moshe. Yoel and Jeff Gilbert bring some of the questions from listeners. How are we to view and use the Book of Psalms? Is it prophetic? Which sects in the Second Temple period had an Oral Torah and how did it affect the commoner? Can we understand the written text without Oral Torah? Yoel and Jeff continue the discussion on the Oral Torah, part 5. Oral Torah, what is it, what WAS it and who can make it? Join us in this series from TalkingTorah.org, as Yoel and Jeff Gilbert explore the history and usage of the Oral Torah. In Part 3 we go in depth into the canonization of the Tanakh, and specifically the issues with the Document Hypothesis.